SPOKANE, Wash. – The difference between life and death in the operating room, on the battlefield or during a police shootout often comes down to the ability to adapt to the unexpected. Sleep deprivation may make it difficult to do so, according to a Washington State University study published this month in the journal Sleep. For the first time, WSU researchers created a laboratory experiment that simulates how sleep loss affects critical aspects of decision making in high-stakes, real-world situations. Their results provide a new understanding of how going without sleep for long periods can lead doctors, first responders, military personnel and others in a crisis situation to make catastrophic decisions. Recent history is full of examples of the sometimes devastating consequences of people operating without enough sleep. Investigations into the Chernobyl nuclear power plant meltdown in Ukraine, the grounding of the Exxon Valdez oil tanker and the explosion of the space shuttle Challenger all concluded that sleep-deprived operators played a role in causing the accidents. A long-standing conundrum for sleep scientists has been creating a controlled lab situation that sufficiently simulates the circumstances leading to severe lapses in real-world judgment. Previous laboratory research consistently showed sleep loss degrades attention, but its effects on demanding tests of cognition like decision making appeared to be relatively small. In a natural context, decision making is a dynamic process that requires a person to learn what is going on nearby as a result of his or her actions and changing circumstances. A surgeon, for instance, might notice a change in a patient’s vital signs midway through a procedure. The surgeon can then use this feedback decide a better course of action. 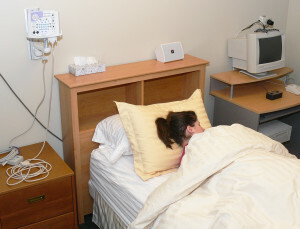 Facilities at WSU’s Sleep and Performance Research Center allow for both scientific data collection and a restful night’s sleep. Whitney, Hinson and Hans Van Dongen, director of the WSU Sleep and Performance Research Center at WSU Spokane, along with Melinda Jackson, now of the RMIT University, Victoria, Australia, recruited 26 healthy adults to take part in their study conducted at the Spokane sleep center. Thirteen of the participants were randomly selected to go 62 hours without sleep two days into the study while the other half of the group was allowed to rest. For six days and nights, the participants lived in a hotel-like laboratory where they performed a specially designed reversal learning task to test their ability to use feedback to guide future decisions. In the task, subjects were shown a series of numbers that, unknown to them, were pre-assigned to have either a “go” (response) or “no go” (non-response) value. They had less than a second to decide whether or not to respond to each number shown. Every time they correctly identified a number with a “go” value, they received a fictitious monetary reward. Errors resulted in a loss. After a while, both the sleep-deprived group and the controls started to catch on and selected the right numbers. Then the tricky part came. The researchers reversed the contingencies so that participants had to withhold a response to the “go” numbers and respond to the “no go” numbers. The switch confounded the sleep deprived participants. Even after being shown 40 numbers with reversed contingencies, they had almost zero success. On the other hand, the rested participants would catch on to the switch within 8-16 numbers. The data show that no matter how hard a person wants to make the right choice, sleep loss does something to the brain that simply prevents it from effectively using feedback. The study provides a new tool for investigating how sleep deprivation produces decision errors in real-life situations where information emerges over time. “People in high-stakes environments are held accountable for their actions when they are fatigued just like everyone else,” Van Dongen said. “However, we now know that when someone is sleep-deprived their brain simply can’t process feedback from their actions and changing circumstances. “Our findings tell us that putting sleep-deprived people in perilous environments is an inherently risky business and raises a number of medical, legal and financial implications,” he said.